(Johns Hopkins, 2017) xvii + 393 pp. Reviewed by Kevin Hutchings on 2017-07-03. Here, Bewell lays the groundwork for a critical reconsideration of the material world in all its complexity, acknowledging not only the diversity of global environments and biotic communities, but also the diversity of contested environmental knowledges, both Western and indigenous. By investigating a plurality of "natures" with an eye towards both their materiality and their associated cultural meanings and values, Bewell's book effectively dismantles the polemicized dichotomy between nature and culture which, in foundational texts on "Green Romanticism" such as Jonathan Bate's Romantic Ecology (1991) and Karl Kroeber's Ecological Literary Criticism (1994), pitted the material concerns of ecocriticism against the political engagements of New Historicism and other modern-day modes of critical theory. As a key part of its investigation, this book builds upon Alfred W. Crosby's Ecological Imperialism (1986) and Richard H. Grove's Green Imperialism (1995), which both considered how European imperial expansion led to the mobilization of biological organisms. In the Introduction and elsewhere, Bewell traces the mobilization of plant and animal species that followed the movements of human populations. These organisms travelled sometimes as the result of a deliberate colonialist effort to create "improved" European environments and societies in distant places, sometimes as part of a systematic scientific and commercial appropriation intended to enrich the imperial center, and sometimes via their own biological agencies (as in the global movement of pathogens, which Bewell memorably examined in his ground-breaking 1999 monograph Romanticism and Colonial Disease). During the long Romantic period, the facilitation of these plant and animal movements was an integral part of cosmopolitan natural history, which is said to have "constituted a project of material and cultural translation on a global scale" (35). As Bewell notes, natural history was much more than merely a taxonomic activity. Rather than simply "collecting and classifying specimens," it "was a translational world-making activity, which mediated colonial natures through their portable forms" (37-8). In the course of these mediations, local natures were subject to profound physical and representational transformations, processes that resided at the very heart of the colonial enterprise. "Britain in the late eighteenth century and early nineteenth century was, in all aspects," Bewell observes, "a translational culture, one that augmented its power and enriched itself poetically, scientifically, culturally, and materially by translating things from one place, state, form, or condition to another" (34). By analyzing the various ways in which these translational processes supported British colonialism at the expense of aboriginal peoples and natures, Bewell's book exemplifies a form of material criticism that is fully engaged with questions of politics and power. After laying this critical groundwork, Bewell turns in Chapter One to Erasmus Darwin's immensely popular poem, The Botanic Garden. Though dated in its poetic style, it presented "a thoroughly modern conception of a natural world that was undergoing ceaseless change and transformation and was inescapably bound up with global commerce, industry, and consumption" (54). Members of England's landed gentry, Bewell notes, adorned their properties with coveted non-local species as "expressions of power," creating in the process a cosmopolitan "natural landscape in England that had never existed before" (58). Among the chapter's most interesting discussions is its analysis of the Royal Botanic Gardens at Kew (69-78), which served "as the clearinghouse and administrative center of a vast [global] network of botanic gardens" in whose precincts "newly introduced cosmopolitan plants were naturalized to new climates and conditions" (77, 71). As a product of this imperialistic culture, Bewell argues, Darwin's poem celebrated a "vision of the capacity of human beings to change natural ecologies everywhere" (78). Bewell then proceeds to show how contemporary natural history served "the commercial globalization of natures" (100). As he fascinatingly explains, the travelling of such natures was epitomized by the transplantation of breadfruit -- effected by figures such as Joseph Banks and William Bligh -- from Tahiti to Saint Vincent and Jamaica, where, colonialists hoped, it would become an inexpensive source of nutrition for African slaves. Closely reading a mezzotint by Thomas Gosse (see below), Bewell describes the transformation of breadfruit from "a local insular nature" (96) to a globalized, "translated nature," in the course of which it "became something very different from what it had previously been" (96, 97). Thomas Gosse, Transplanting of the Bread Fruit Trees from Otaheite (1796). Hand-colored mezzotint. Captain Cook Memorial Museum, Whitby, North Yorkshire, England. Bewell also notes that since the ocean-going ships carrying the breadfruit -- the Bounty and the Providence -- were retrofitted with modern technologies, they could "serve as mobile botanic gardens" designed, ultimately, to "produc[e] the nature that the British would eventually claim" by replacing an imagined "terra nullius with one that was cultivated" (110, 115). 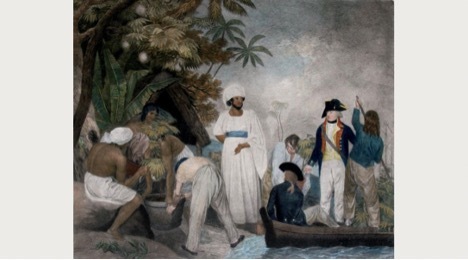 Arguing that Bligh's first mission and its notorious mutiny have been over-emphasized, Bewell reminds us that the British government's two-time decision "to send a ship on a thirty-thousand-mile expedition just to transport a collection of plants from one part of the world to another" was itself "extraordinary" (98). By putting the breadfruit at the center of his analysis, Bewell provides an interesting alternative to more anthropocentric accounts of Bligh's famous expeditions. Turning from the transportation of breadfruit to the colonizing of Australia, Bewell shows how natural history there became "the means by which a local indigenous nature, characterized as inferior, was to be replaced by another nature built for settlers" (126). Citing previous studies by Bernard Smith, Paul Carter and Nicholas Thomas, and J.M. Powell, Bewell argues that in colonial Australia "the conflict between old and new natures was often as intense as the conflict between peoples" (127). To illustrate the role of natural history in these related conflicts, Bewell closely reads another mezzotint by Thomas Gosse--Founding of the Settlement of Port Jackson (1799) -- as well as Erasmus Darwin's poem "Visit of Hope to Sydney Cove," which appeared in Arthur Phillip's The Voyage of Governor Phillip to Botany Bay (1789). Together, Bewell explains, the poem and the picture show how the Australian landscape underwent "a kind of biological translation" because it was implicated in "a broader global remaking of natures made possible by the managed transfer of plants and animals across a worldwide network of trade that radiated out from Kew Gardens" (137). Examining also a rich assortment of contemporary documents and visual images (including John White's illustrations of Australian flora and fauna, Sarah Stone's avian drawings, and aboriginal rock etchings and paintings), Bewell shows how the early colonial print culture of Australia informed and enabled this biological translation. Meanwhile in rural England, Gilbert White redefined translation. While cosmopolites such as Joseph Banks saw natural history as an ethical enterprise facilitating the global mobilization and translation of natures, White's The Natural History of Selborne (1788) forged what Bewell calls "a science of the local." Although White adopted the scientific methods used by Banks and other cosmopolitan naturalists, he prized above all the "deep relationship between nativity and place and the multifarious ways in which creatures inhabited his locality" (155). Because White valued plants and animals for their rootedness in place, his own translational activities were textual, turning flora and fauna into words rather than moving them around the world physically. These verbal translations came to epitomize what contemporary readers understood as "'English nature,'" embodying textually "the national myth of England as a domestic rural idyll" (158). In analyzing White's responses to local birds and animals, including his discussions of animal psychology and sensibility, Bewell enriches the field of animal studies. Turning from White's England to the United States, Bewell reads The Travels of William Bartram (1791) as the work of an American naturalist who "straddles two worlds" and whose narrative, like Wordsworth's writings, evinces a "double consciousness" (198, 197). Here Bewell considers the generic tensions between Bartram's scientific interests as a natural historian and his moral "quest to find his identity and place in the world" (201). Just as Bewell highlights White's attention to animals, he stresses Bartram's conception of them "as moral and intellectual beings" and "living agents" (204, 205). Furthermore, Bewell argues, the same open-mindedness that informed Bartram's moral defense of animals can be seen in the young naturalist's musings on Native Americans. According to Bewell, Bartram recognized that far from being untouched wildernesses, America's remote southeastern landscapes had been "shaped by mobility, conflict, and displacement" (215). The study of them revealed much about "the relationship between past cultures and the natural world" (218) while also providing Western readers with moral and material lessons on ecologically sustainable living. Turning back to England by way of William Cullen Byrant, Bewell shows how Bryant's poem on the Great Plains -- "The Prairies" -- was deeply influenced by Wordsworth's "Michael" and "The Ruined Cottage." But literary influence here flowed both ways. "The reason why Bryant so easily adapted Wordsworth's poetry to interpreting the ancient history of the American continent," Bewell writes, "was that Wordsworth had already learned from Bartram how to read the life of human beings in the natures that they left behind" (231). Having made his name almost thirty years ago with Wordsworth and the Enlightenment: Nature, Man, and Society in the Experimental Poetry (1989), Bewell sensitively illuminates "The Ruined Cottage," "Michael," and the Guide through the District of the Lakes. In analyzing these three works, he astutely challenges the New Historicist readings of critics such as Jerome McGann and Alan Liu, who famously argued that the poet's invocations of nature served ideologically to hide inconvenient realities of human social history. "The idea that Wordsworth's close attention to plants is a blind or escape from history is ... fundamentally mistaken," Bewell demonstrates, for it fails to recognize that Wordsworth read local history itself in "the very plants that composed a place," understanding "the natural [as] one of the primary sites of [historical] transformation, conflict, and change" (237). Romantic localism is likewise exemplified by the poetry of John Clare, which is said to document "the social and ecological cost of modernity by addressing the dislocation caused by the destruction of an English rural nature that had been deeply bound up with the long-standing traditions of English rural life" (273). For Bewell, however, Clare was not simply a "peasant poet" whose localism was shaped primarily by his social class, for, although Clare disagreed with the environmental practices of England's "landowning and professional classes," he "strongly differentiated himself from other laborers who showed little appreciation of the natural world around them" (274). Among other things, Bewell examines the tension between Clare's understanding of nature as an eternal and unchanging presence (as in his poem "The Eternity of Nature") and his elegiac recognition that enclosure was stifling local natures and associated ways of life. In Clare's eyes, according to Bewell, the mobilization of nature celebrated by colonial natural historians such as Erasmus Darwin and Joseph Banks was "a greed-driven act of dispossession" (283) -- an act Bewell compares to the colonial dispossession and removal of indigenous peoples and natures in more distant corners of the globe (273, 289-90). In his penultimate chapter, Bewell returns to the mainstream of British natural history, demonstrating how Charles Darwin's idea of nature changed as a result of his global travels. Before his 1832 voyage on the Beagle, Darwin viewed nature as "stationary, and travel and the colonization of new territories [as] essentially human privileges" (296). Afterwards he saw nature itself as "profoundly linked with mobility and change," and the "geographical distribution of species as ... the expression of a long and complex history of conflict and settlement" (297). Confirming this new understanding, his subsequent study of Charles Lyell's three-volume opus Principles of Geology (1830-1833) encouraged him to see colonial ecological displacements not as exceptional but as expressions of "the fundamental laws and processes governing nature at all times and in all places" (303). By making mobility a central tenet of his evolutionary theory, Darwin posed a potent challenge to the nationalistic prejudices informing "blood-and-soil" models of cultural identity. But for Bewell, Darwin's model had its drawbacks. In assuming that nature itself was caught up in wars caused by "populations . . . always push[ing] beyond the territories that sustain them," Darwin's evolutionary theory ultimately "extend[ed] what he saw happening in colonial environments to the idea of nature itself," thereby limiting "the possibilities of thinking about our relationship to nature in alternative ways" (326, 327). Having considered a wide variety of mobile natures as represented in a broad array of texts, Bewell concludes his book with a chapter entitled "Frankenstein and the Origin and Extinction of Species." Rather than treating Victor Frankenstein's creature as a marginalized human figure (as most critics have done), he follows Maureen McLane's lead in depicting him as "an entirely new biological entity" comprising "many races and natures" -- a singular new lifeform "stand[ing] outside of all organic relationships or kinships" (331). From Frankenstein's xenophobic perspective, the creature's desire for a female counterpart with whom to procreate poses a terrific threat to humanity: the potential introduction of a deadly "'invasive species'" (328). Lacking biological ancestors, and denied the ability to propagate his kind, the creature is, Bewell remarks, "truly a biological monster" (337). In its depiction of the creature's solitary dilemma and ultimate extinction, Shelley's novel anticipates themes she would further explore in The Last Man, an apocalyptic narrative focused on the depredations of "another traveling nature, a global pathogen" (340). Given Bewell's remarkable study of pathogens in Romanticism and Colonial Disease (1999), one might say that Natures in Translation leaves off where his previous book begins. As a student of British Romanticism, I have long admired Alan Bewell's generous and deeply learned scholarship, and I'm delighted to say that his new book fully lives up to the high hopes I brought to my reading of it. I consider this critically innovative and beautifully written book essential reading not only for scholars and enthusiasts of eighteenth- and nineteenth-century literatures, but for anyone interested in gaining new insights into the literary history of environmentalism. Kevin Hutchings is Professor of English at the University of Northern British Columbia, Canada. Leave a comment on Kevin Hutchings's review.